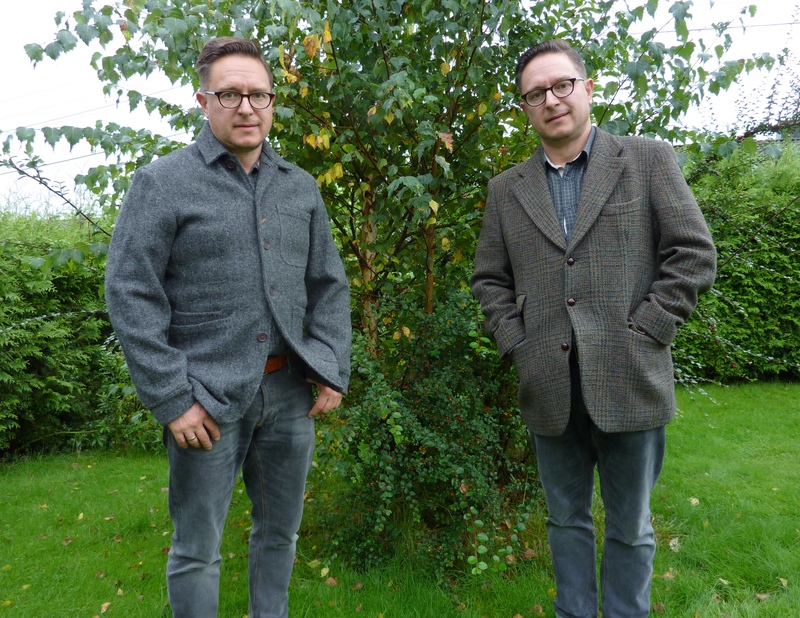 Tweed jacket upcycle project: Day two - the front room - Well Dressed Dad - It is a proper menswear blog. Like, with original words and opinions and suchlike. 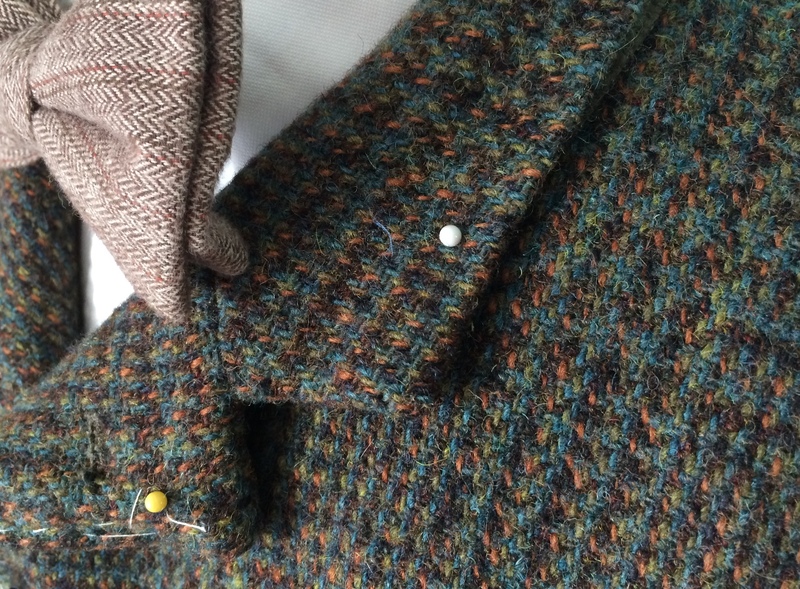 Last week I posted part two of my Harris Tweed jacket upcycling project. If you’re only just coming to find it, you’ll want to read back to the original idea outlined here, and part one here, ok? I’ll wait patiently until you’re up to speed on what is going on here at the Laboratory of Total Tweedism. 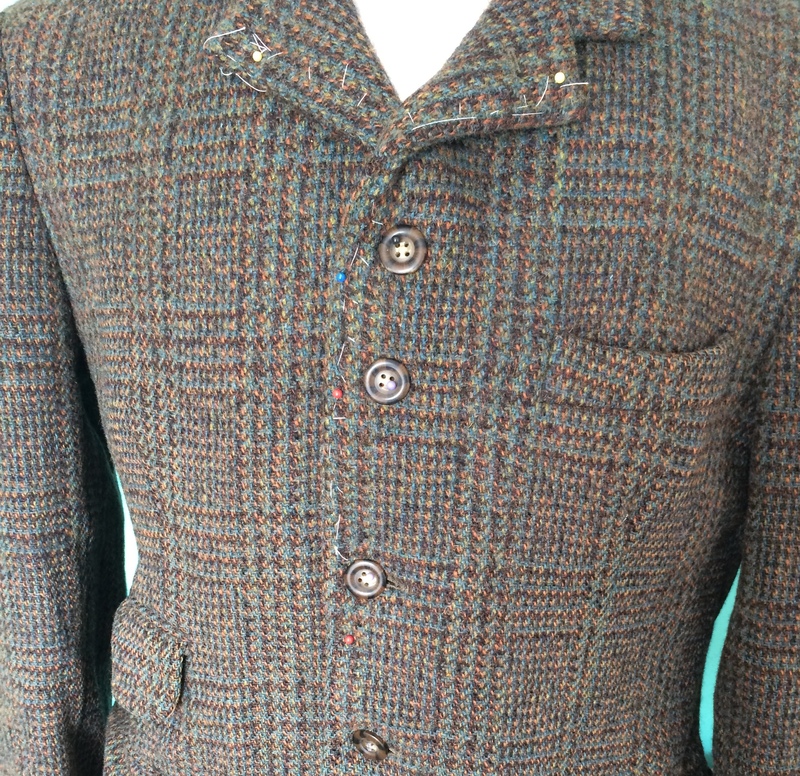 So, the sun rises on day two and we have a vintage Harris Tweed jacket from the 1960’s. Now without shoulder pads, and hopefully without half a century of accumulated dirt hiding in the lovely wool fibres. It took almost two days for the jacket to stop dripping water and another day to be dry to handle. If the ability to retain water was a mark of desirability, this old tweed is a winner in that respect as well. What next, you are asking? 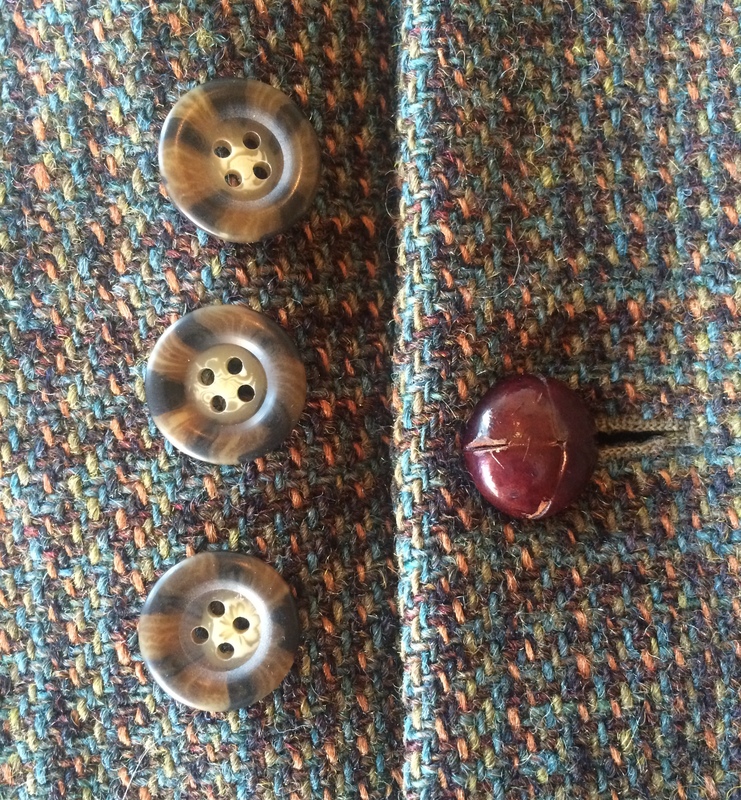 The lapels and buttons, I reply. 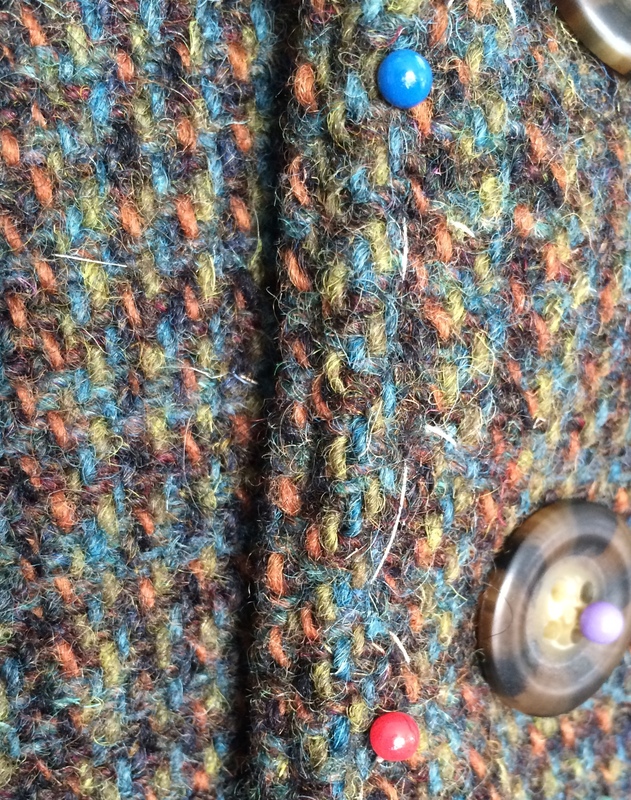 My plan is to change the lapels into a much smaller variant and add more buttons. Less blazer, more jacket, if you like. Notice the felt lining peeking out? 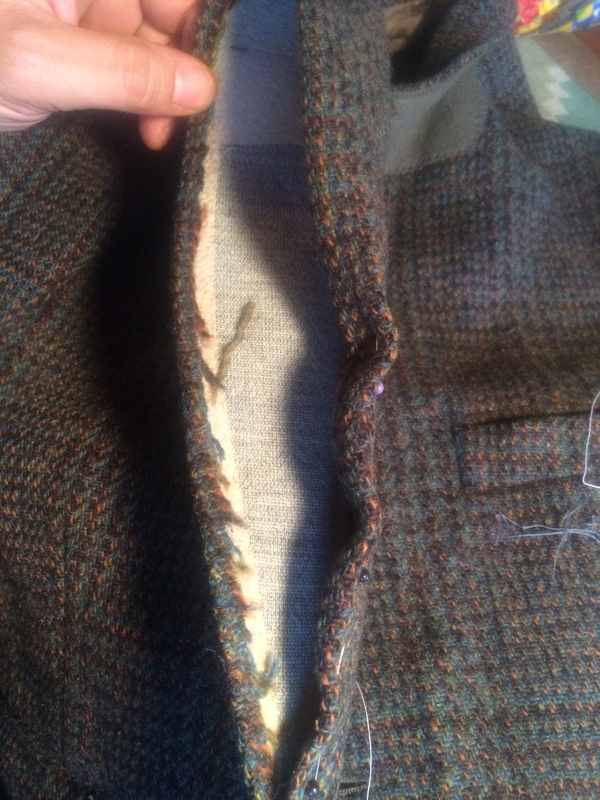 A couple of points to take notice of here: The inside of the collar is lined in felt, so this limits how small I can make the lapels before the felt shows. 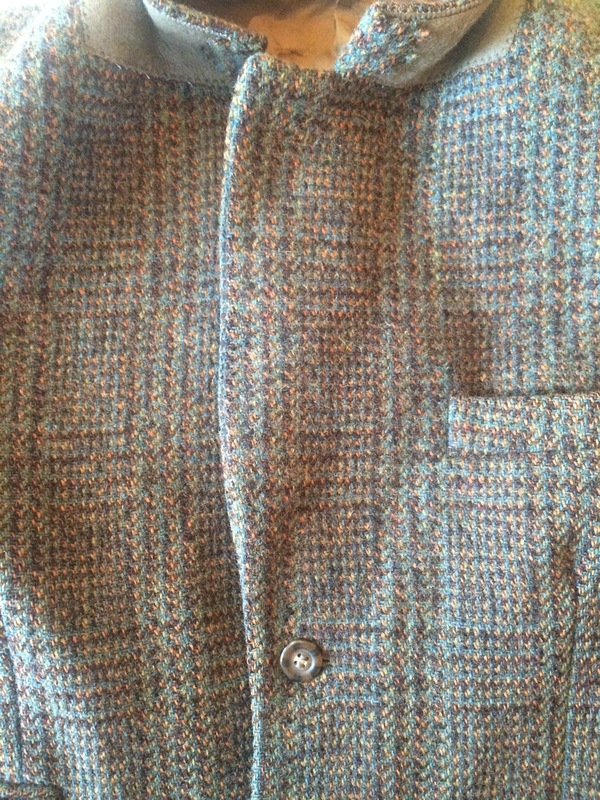 And more immediately: When the lapels are unfolded, the line up the front of the jacket is not straight. To fix the front we need to get down and dirty and actually undo and redo the stitching. My first plan of action was to go in through the lining again and do it the proper way. However, the lining and construction prevented this, there is just too much to start undoing to get there. The second idea was to undo the stitching from the outside and then hand sew it back after adjusting. Carefully undoing only what needs to be undone, basically down to the first of the original buttons. And then carefully folding and pinning the new line. Once pinned down and checked, basting stitches are added to keep it in place. Amazing array of colours in the vintage weave! 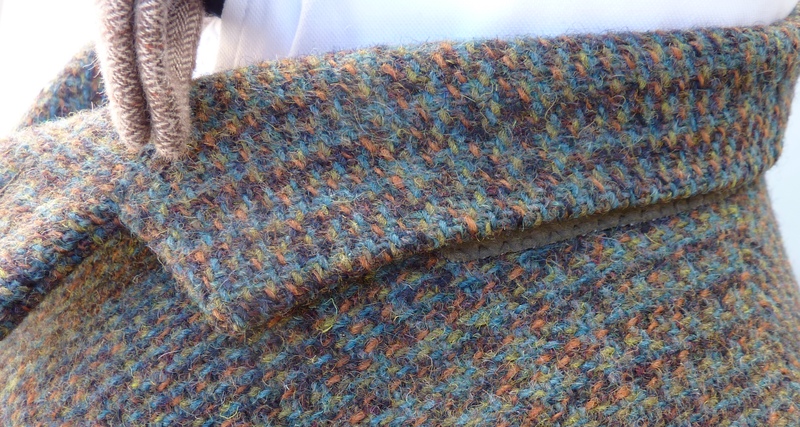 Given that the tweed has been folded in it’s old shape for around 50 years, not to mention the other fabric on the inside, it pays to be really careful and accurate here, otherwise it will show up as a lumpy front when all finished.The different colours in the tweed are a good help here, as it is much easier to line up the folds (and of course, also that much more obvious afterwards if I’ve not been accurate…). Looks almost straight. Hopefully the final touch will come when I steam it. Once this has been carefully hand stitched in place, closing a thread that blends well with the colours of the wool, it’s time to get out the steam iron and very carefully use lots and lots of steam to get the wool settled into it’s new shape. And some careful adjustment here should work out well. After that I can reset the collar in the same way, and then add in the new buttons and button holes. Speaking of buttons, I changed the original ones to horn buttons. My preference, and also I don’t have any spares like the originals, so I’d have been a bit stuck in any case. The arms only have a single button, and the open cuff is really short, so I may add a couple more there as well, to increase cuffage status. This is very exiting! I think maybe buttons are not evenly placed on front? The top three are just held in place with pins, for illustrative purposes!